I've recently acquired both David Kalat's Godzilla filmography book, and Japan's Favorite Mon-Star by Steve Ryfle. Aside from Guy Tucker's Age of Gods, is there any english language books that you would consider ESSENTIAL to a print collection from a quasi-intellectual level? (Note, I already own Godzilla on my Mind and the Official Godzilla Compendium). I don't know that it exactly meets the criteria you laid out, but the recent kaiju movie poster book that Sean Linkenback put out is rather spectacular. I got it recently and am loving the heck out of it. It's informative and has the most comprehensive collection of theatrical posters and lobby cards from pretty much every country that made them that I've ever seen. And there's a lot of rare stuff that I've never seen or even knew existed. It's great! canofhumdingers wrote: I don't know that it exactly meets the criteria you laid out, but the recent kaiju movie poster book that Sean Linkenback put out is rather spectacular. I got it recently and am loving the heck out of it. It's informative and has the most comprehensive collection of theatrical posters and lobby cards from pretty much every country that made them that I've ever seen. And there's a lot of rare stuff that I've never seen or even knew existed. It's great! Yeah, I just remembered that I picked that up as well. I also have the 1st and 2nd editions of August Ragone's book on Eiju Tsuburaya. Jorzilla wrote: I also have the 1st and 2nd editions of August Ragone's book on Eiju Tsuburaya. Monsters Are Attacking Tokyo by Stuart Galbraith IV is really good. Basically the history of Japanese genre films as told by the people that made them. Cody Himes wrote: Monsters Are Attacking Tokyo by Stuart Galbraith IV is really good. Basically the history of Japanese genre films as told by the people that made them. Yup. This one is the gold standard, IMO. 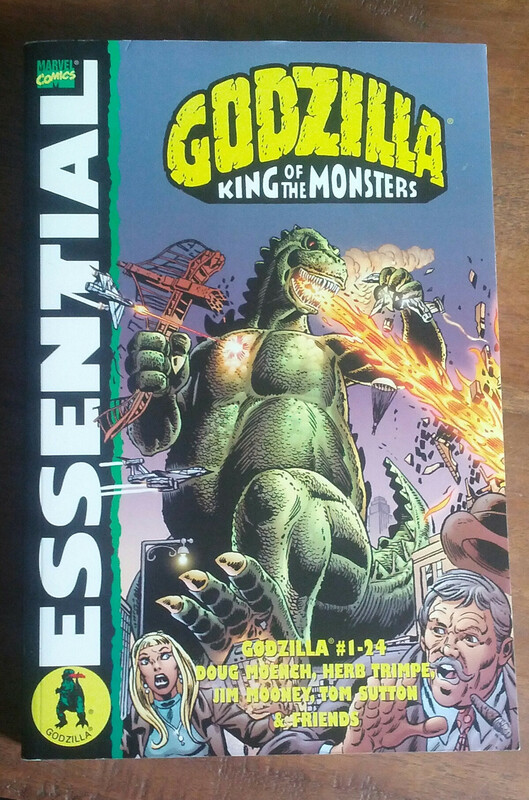 Also, Ed G's Encyclopedia of Godzilla. But good luck finding that at a decent price. The only serious behind-the-scenes book I have is Ryfle's (oh, and the Art of book for the new film). Looking forward to getting August's book on Tsuburaya. I might buy it this month to read at the beach. ....said no one in the history of mankind. Anyways, time to get serious. In regards to Essential American Godzilla books, I've never been all that fond of David Kalat's book and found it highly overrated (alot of his views/insights, such as his hilarious rant on the lack of strong female characters in a film such as Godzilla vs Megalon, are eye-roll inducing and laughable ). To his credit, as least he has updated it to cover the Millenium series as well, which sadly makes it one of the few up to date English G books as most were written in the mid-late 90s. Otherwise, if I want to read silly, pompous reviews on films of the genre, then I'll pick up G-Fan and read film reviews by the likes of Peter H. Brothers and co. (though in fairness to Kalat, he's not near as bad as Brothers in that regard). Guy Tucker's Age of the Gods - Don't own it, but have met several acquintences who had and let me look through it...it is indeed worth the hype. August Ragone's Eiji Tsuburaya: Master of Monsters, which focuses on the man's entire career work and not just Godzilla/Ultraman. Godzilla: The Art of Destruction that goes along with the most recent film. Stuart Galbraith's Monsters are Attacking Tokyo - A very solid book, though like Kalat's, I find it just a tad overrated. I know it gets picked on alot (and rightfully so in some cases), but the Godzilla Compendium is not all that bad if found at a low price. Any edition of Japanese Giants or early issues of G-Fan. Hopefully Ed G and Ryfle's upcomong Honda book can be added to the list someday...if it ever comes out that is. Yeah I'd definitely add Art of Destruction to the list. And Galbraith's first book Japanese science Fiction, Fantasy and Horror Films is also really good. It's outdated now but when I was a kid and didn't have the internet, that book was basically my bible. ebirahsmeg1 wrote: Any edition of Japanese Giants or early issues of G-Fan. and #10 is the same for Godzilla 1954. Each is 64 pages entirely devoted to a single film and you can't find better information. Ed G's Illustrated Encyclopedia is pretty good, but I think Mon-Star covers almost all of the same material in more detail. I'd still recommend Illustrated Encyclopedia for the behind the scenes sections although a lot of the information, photographs, and concept art have been online for years. I'd kill for a copy of Age of the Gods. Apparently the B&W collection of Marvel comics fits the criteria of "Essential"
ebirahsmeg1 wrote: In regards to Essential American Godzilla books, I've never been all that fond of David Kalat's book and found it highly overrated (alot of his views/insights, such as his hilarious rant on the lack of strong female characters in a film such as Godzilla vs Megalon, are eye-roll inducing and laughable ). To his credit, as least he has updated it to cover the Millenium series as well, which sadly makes it one of the few up to date English G books as most were written in the mid-late 90s. Otherwise, if I want to read silly, pompous reviews on films of the genre, then I'll pick up G-Fan and read film reviews by the likes of Peter H. Brothers and co. (though in fairness to Kalat, he's not near as bad as Brothers in that regard). I havent read any of David Kalat's work, but his Criterion audio commentaries are fantastic and insightful, and I really dig his tone and sense of humor.